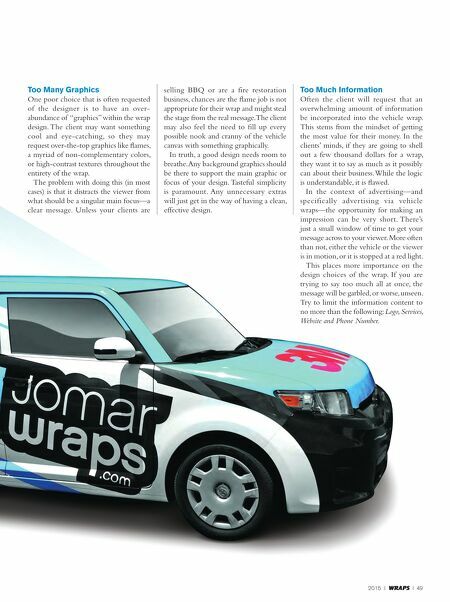 48 I WRAPS I 2014 Designing for PeoPle Who Don't UnDerstanD Design - W r a p D e s i g n - D e s i g n B y s t e p h e n s i n e k Reigning in inexperienced clients and helping them implement good design principles W hen designing a vehicle wrap, how do you reign in a client who has no clue about basic design principles? It can be a very frustrating scenario for the designer, whose goal is to implement these principles in a way that is both visually pleasing and effective. What works and what doesn't? Many of the client-generated design pitfalls will fall into the same few categories. Here is my advice on how to steer your well- intentioned clients around the cliff instead of letting them drive their company wrap right over the edge. stephen sinek first started in the sign business with Phoenix-based SNA Graphics where he worked his way up to Art Director. In 2006, he started his own business, Seven Sin Design. 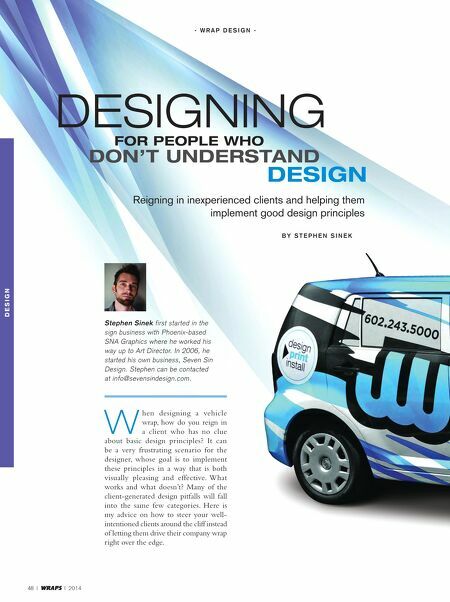 Stephen can be contacted at info@sevensindesign.com.